Review With touchscreen smartphones all the rage, handsets with a decent spec and a 3in or larger screen are now filtering down to PAYG packages priced at around £100. For that sort of money you don't have a huge choice - the Orange San Francisco, Samsung Europa and Sony Ericsson X10 Mini stand out as the few worth considering. 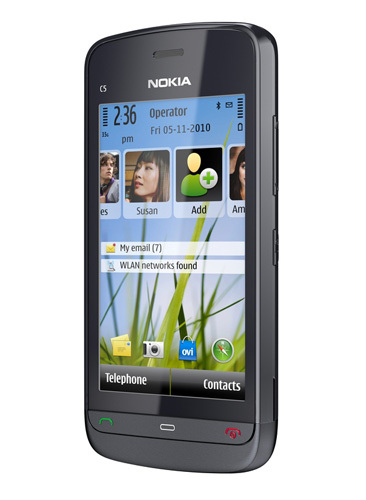 The latest to join them is Nokia's C5-03. Of course that price brings with it some compromises. To begin with C5-03 uses S60 Release 5 or as it's now called Symbian^1 which is starting to look like Bronze Age technology in an Iron Age world. As an operating system and interface it's both limited and inflexible, even when compared to Symbian^3, which the Nokia C6 and C7 use, never mind Android. The screen itself is also built down to a price. The resolution of 360 x 640 may be tolerable as is the corner-to-corner size of 3.2in, but it's resistive rather than capacitive and the LCD panel's visual performance is poor. The colours are not overly vivid, the image not particularly bright, viewing angles are restricted and performance in direct sunlight is wretched. It's not all bad news though. 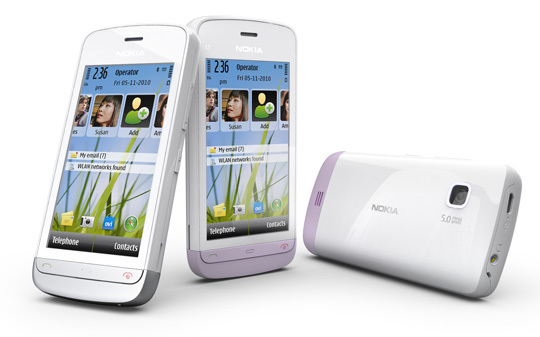 The C5-03 is another example of the currently excellent build quality from Nokia, matched by a clean, smart design ethic, complete with multiple colour options. And at only 106 x 51 x 14mm in size and 93g in weight, it is very pocketable. In fact, leaving aside the microscopic X10 Mini, it’s arguably the lightest touchscreen phone around. Externally the C5-03 features volume and on/off/lock keys on the right hand side along with micro USB and 3.5mm audio interfacing up top. The call and menu buttons below the screen have a solid feel to them that belies the price point and the plastic materials. The handset can be recharged from either USB or the 2mm mains adapter that plugs into the bottom of the handset. The C5-03 comes with all the basic smartphone bells and whistles including 802.11b/g Wi-Fi, 10.2Mbps HSDPA, A-GPS with Ovi Maps for free turn-by-turn navigation. Naturally, there’s Bluetooth, a 5Mp camera and an RDS FM radio. You also get free 2GB MicroSD card to complement the meagre 40MB of available built-in storage. One thing the handset is missing is a proximity sensor to bring the screen to life when you take it away from your ear. Once the screen has timed-out you need to revive it manually.